Freezer meals are the hottest blog topic these days. And I am all about it! They are just so smart. Make meals when you have time. And they are ready to go when you need them. 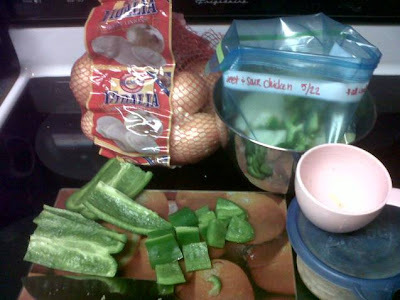 Today we are making sweet and sour chicken. I used more of the shredded chicken that I made here, but you can certainly just cut up raw chicken. You will just need to cook it longer. I also used more of the onions from here. So this meal came together in just a few minutes. If you are making it to eat the same night, there is no need to place it in a zip top baggie of course. Be sure to write on the bag what you have inside and any instructions BEFORE you fill up the bag. I plan to serve this over rice but it would also be yummy over egg or rice noodles. By now y'all know that I keep portions of cooked brown rice in my freezer at all times. * Chop veggies and if necessary, chicken. * Dump all ingredients into a zip top freezer bag. Freeze flat. * Thaw the night before using. * Dump thawed bag into crockpot. 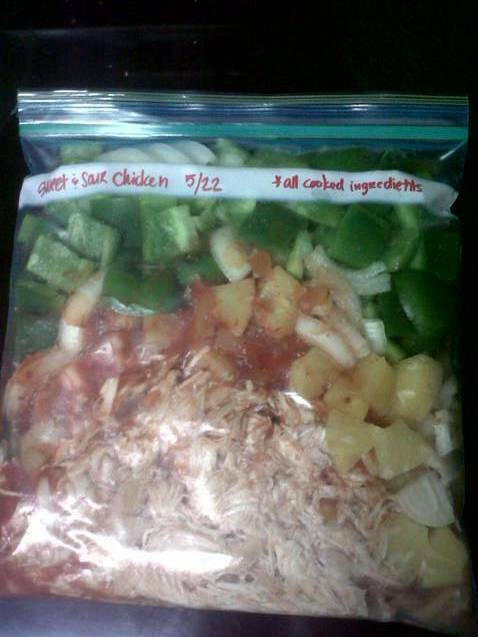 If using cooked chicken, cook in crockpot for 2-4 hours on low. If using raw chicken, cook in crockpot 4 hour on high or 8 hours on low. * Serve over rice or noodles. yummy! Looks great too...I also love that it's gluten free. Thanks for sharing :) I definitly want to try. That's so convenient, and looks delicious! P.S. Thanks so much for your sweet comments on today's post! Hope you have a wonderful weekend!